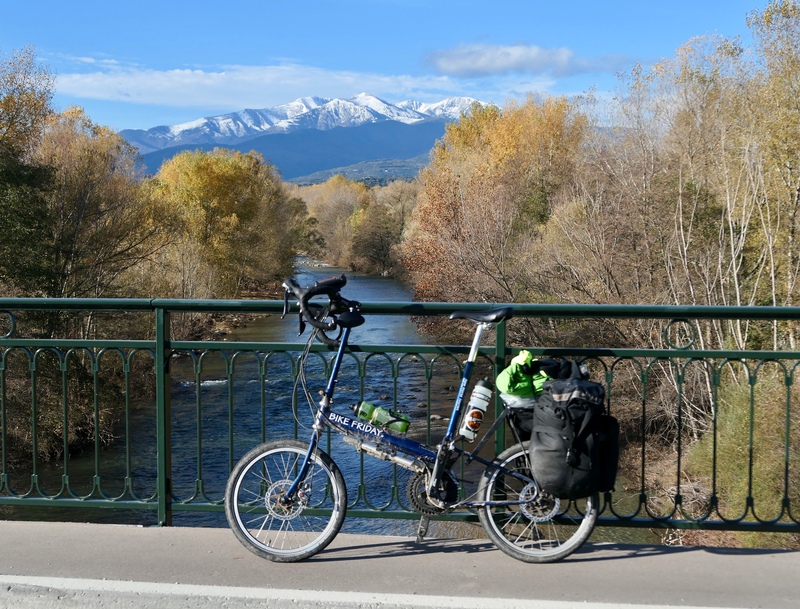 Today we crossed over into Spain, crossing the Pyrenees over the low Col de Panissars, the ancient route the Romans took through the mountains. To call the day adventurous would be an understatement. With a treacherous descent and a barefoot walk in the water, it was a ride not quite like any we’ve experienced, a ride to do exactly once. Not much of a wall shot – do railings even count as walls? We’ll have to wait for the judges’ opinion on that. We weren’t focused on walls today anyway, so I’ll probably keep looking – I’m sure we’ll find an unequivocal wall to write about before we leave here in two weeks. Or, if not here, I suspect Taiwan has a wall or two as well. Continue here to see what else there was besides the wall to make today’s ride one to remember. 1 response to "December’s challenge: crossing the Tech"
A beautiful shot! I would say it would have qualified for the water, tree or bridge challenge, but by no stretch of the imagination is that a wall, Scott. Keep trying.